I have had a bit of a revelation today. I spent some time today sorting through my emails and paperwork and have come across a lot of stuff that I have noticed should have been completed during the months November through to February. I thought this pretty strange as I am usually pretty good getting important stuff completed. It wasn’t until I sat down and thought about it and realized that they were the months when my Dad was in bed all the time and then in February he passed away. I loved looking after him, it was an honour to be there for him at that time of his life, but I now know just how I had put my life on hold so all my energy could be transported to Dad. So this week it is my goal to get all this past stuff completed and filed away. “Living to Learn”: Yesterday I came across a website that is “A Dictionary of Australian Words and their Meanings”. Being Australian I have heard a lot of them, but I still came across a lot that I had never seem before. 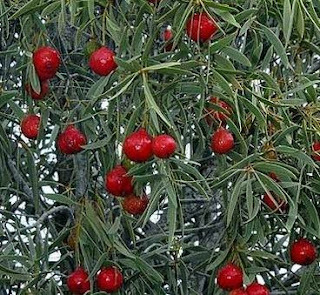 “Quandong” - Aboriginal name for a tree with small bluish-red fruit. The Desert Quandong is a small tree or shrub found in the arid zones of Australia. The tree has paired leaves about 3 - 9 cm long. The fruits are shiny red and sometimes yellow 2 - 3 cm in diameter. The Desert Quandong grows in woodlands on sandy and stony soils. In the northern territory the Desert Quandong is becoming scarce most likely as a result of camel grazing. “Davine Time” update: Curled up in my comfy chair and spending the evening with my beautiful daughter Rachel watching “Desperate Housewives”. An old workmate some time ago used to talk about Quandongs. Actually, she confused Quandongs and condoms. I had no knowledge of them, but I believe they make good jam.